My whole house smells of baking bread. It is wonderful. Perfect for the cool, wet fall day outside. With so much “to cook” on my “to do” list, I happily stepped up to bake a little something for World Bread Day, which I learned about via Kochtopf. Actually, I’ve been thinking about bread a lot these days, having just finished up Susan Seligson’s Going with the Grain, a lovely book of one woman’s travels that are focused around the breads of different cultures. From camping with Bedouins to touring a Kosher bakery to visiting a family in India and making Chapati, where there’s bread, you’ll find Susan. The book offers up one recipe for each chapter, but it’s really more about meeting the people and the culture, and the impact of bread on the community. Definitely a good read. As to my bread for bread day, I got intrigued by the vietnamese mini baguette recipe in the Alford/Duguid Home Baking book after having a few Bahn Mi sandwiches in the past few months. I really love everything about Bahn Mi, the fresh peppers, the seasoned grilled meats, the fresh cilantro… but mostly the light, crisply baguettes… the perfect bite of flakey and chewy. So, when I saw the recipe, I knew I needed to give it a try. Now, like Hot Sour Salty Sweet also by Alford and Duguid, Home Baking is combination travel/history/culture book as well as a cookbook. It’s packed with gorgeous photos of people and bread, and has a large number of recipes. 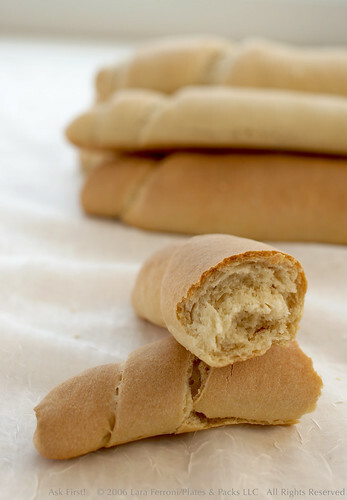 But, the recipes can be hard to follow, and I found that unfortunately, the mini baguette recipe was one of those that needs a bit more clarification at the critical step of how to roll the dough. As a result, I’m pretty sure I rolled my baguettes the wrong way, and they came out more like oddly shaped croissants than the pictured baguettes. I also didn’t get the loft in the bread that I was hoping for, but that wasn’t the book’s fault… more likely inconsistent temperature in my oven. Still, the bread was quite tasty, fairly light and had that really nice crisp crust that the bahn mi bread has (due to using a bit of rice flour in the mixture instead of straight wheat flour). The recipe also calls for two ingredients that I didn’t have – pastry flour and wheat malt syrup. I used the suggested substitutions, but I’m betting that they would have been lighter and fluffier if I had used the pastry flour and malt syrup instead of all purpose and cane sugar. Mix the rice flour and the first wheat flour (1 cup of pastry or 3/4 cup of all purpose) along with the baking powder in a dish and set aside. Combine the water and yeast and let sit to proof. Then add the malt syrup (or sugar) and stir to combine. Sprinkle in the salt and the rice flour mixture, and mix with a wooden spoon. Then, transfer the dough to a stand mixer with a dough hook and mix on low for about 1 minute. Add the 3 1/2 cups of the all purpose flour, continuing to knead with the hook for about 3 minutes until its all combined and forms a smooth dough. Then, turn the dough onto a lightly floured surface and knead for another minute by hand. Transfer the dough to a large bowl, cover and let sit in a warm spot for an hour and a half, or until doubled in size. Turn the dough out onto a lightly floured surface and carefully punch down. Cut the dough in half, and then cut each half into 4 pieces. Roll each piece into a bowl, and flatten a little. Then, cover the dough balls and let rest for 10 minutes. Take one dough ball at a time, leaving the rest covered, and roll out with a rolling pin to an oval shape about eight inches long and six inches wide. Now, here’s where they lost me in the recipe. The books says, “Roll up into a cylinder, starting from one pointed end and stretching the dough crosswise as you roll, to make a mini baguette about 8 inches long.” I took that to mean starting from the bottom, narrower edge, roll up and pull outwards slightly as you roll to increase the width of the dough from six inches to eight inches. When you do this, you’ll end up with a seam that goes kind of around the loaf instead of going from end to end. I think, now that I’ve cooked mine wrong, that the right thing to do is to pull out a bit more to make sure that the final edge of the seam actually goes from end to end. Next time I make these, I’ll take a photo to demonstrate. Anyway, place the roll, seam side down, on a baking sheet lined with parchment. Repeat with remaining dough balls, and space each roll about an inch and a half a part. Cover and let them sit for another 30 minutes. Preheat the oven to 425F. Bake the bread for 20 minutes total, rotating the baking sheets after 10 minutes. The bread should be golden and sound hollow when tapped. Cool on a rack before serving. Best eaten the same day it’s cooked, but you can freeze the bread if you don’t use them the same day. This entry was posted in Cookbooks, Food, Recipe. Bookmark the permalink. Delicious! Beautifully wrapped! I cannot tell you how much I would love to bite in one! Thanks Bea! I really wish that I had used the pastry flour and they would have been a bit lighter. But, they are cute none-the-less. I have tagged you! But only if you feel like it! Ilva – Fun! I will take a look! Melissa – I’m sure your small baguettes are probably better than this particular batch, but I’d love to hear your results if you try this recipe. Hope it goes better than mine… not that they were bad, just not as expected. I’m tempted to give it another go this weekend. Haven’t made it into The World is a Kitchen yet… just finished up that bread book, and I already had The United States of Arugala in my stack. I think I’m going to stash TWIAK in my bag though so I can read a story or two whenever I get a chance! Just wondering what exactly is with pastry flour? I am always in awe of your pictures. I also appreciate your photography blog a great deal. I would love a bite of these with my morning coffee. 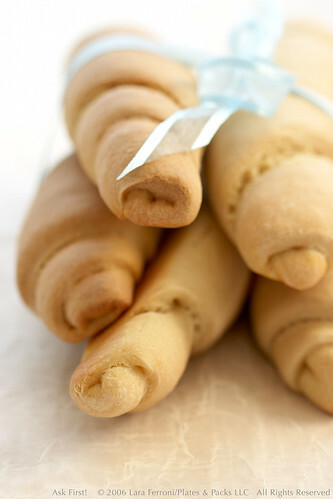 Jenjen – Pastry flour is low protien flour… kind of a cross between cake flour and all purpose. It’s lighter than all purpose. It’s suppose to yield a more tender dough. Helene – Thank you so much! These look really special–I’ve never had one before. Thank you for the Seligson book recommendation. That is something I think I would really enjoy reading. I’m going to look for it on amazon. Hi. Nice blog. I really like Jeffory and Naomi’s books especially their first, Flat Breads and Flavors. I am also a big fan of Bahn Mi’s, having learned about them from John and Matt Thorne in their book Pot on the Fire, I think. Their recipe for the sauce is outstanding! Flavor explodes on your tongue. Anyway, I tried this bread recipe and was totally disappointed in it: neither the flavor nor the texture was satisfying. It has been a little while, but I think I remember that the shape was off too. ALl in all, not a success. I am begrudgingly willing to try them again sometime though, but am not confident. Some recipes just are not good, for whatever reasons. Does the recipe call for Teaspoon or Tablespoon? The “T” could stand for either. I just want to make sure I have the right recipe. I use uppercase T for Tablespoon and lowercase t for teaspoon in my recipes. I recently had a friend come and make a bread from Central Asia for me, and it was such a delightful surprise I’ve been inspired to make breads from around the world. This one you’ve provided is a gorgeous find – thank you for posting it and sharing your adventures in baking. You have a simple beautiful site, both your posts and photography are wonderful. Thanks again!